Charlie Anderson is sure of himself. He’s sure he’s the best consultant in town. He’s completely sure his clever wife Anna, in line to be the first female CEO in the Bank’s history, is the love of his life and his three smart, happy daughters are the centre of his world. And there’s no question in his mind he’s a first-class liar and seducer. In all things, Charlie knows the rules of the game. But what happens when he meets someone who can outplay him? Or when Anna’s rising star threatens to outshine his own? Or when his daughters begin to draw the attention of men – maybe even men like him? 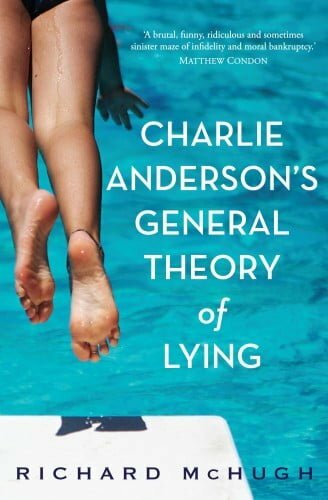 Ranging from the politics of the bedroom to the post-GFC economy, Charlie Anderson’s General Theory of Lying is a wildly entertaining portrait of coming unstuck. Funny, provoking and confronting, it is a remarkable debut novel that shows us afresh the world we live in now. After his unpublished novella about a lovestruck teenager was shortlisted for the Australian/Vogel prize in 1990, Richard McHugh completed his studies at Sydney and Yale, worked as an office angel in London and a Wall Street attorney in New York, and wintered with his partner and their baby in Utah. They now live in Bronte with an unexpectedly large number of children. When he is not driving two sons and two daughters around greater Sydney, he works as a barrister, makes photographs and writes. Charlie Anderson's General Theory of Lying is his first novel.